On each training night, each member is guided through basic pet handling, and may progress into competition handling if they wish to do so. Our pet handling is based on the Kennel Club Good Citizen Scheme which is the largest dog training programme in the UK, which has operated since 1982. The scheme being open to all dogs, young or old, pedigree or crossbreed, whether Kennel Club registered or not. There are 4 levels of courses from Puppy Foundation, to Bronze, Silver and Gold Awards. The Venues vary between the Summer and Winter. Our outdoor SUMMER venue is Coundon Hall Park (post code CV7 8JG), with the park entrance on the Tamworth Road, opposite the Royal Court Hotel (at the northern end of the park). In general, training classes are provided on Thursdays at this venue, starting at 7.30pm and last approx. 30 minutes. There is an Annual Membership fee of £10 (single membership) or £12 (family membership). 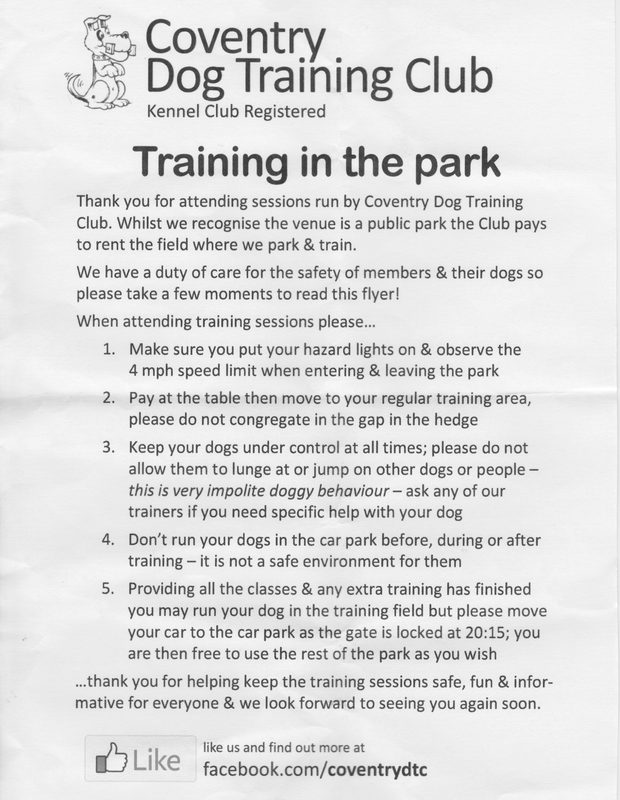 The cost of a 30 minute training session is £4 per dog.